If the world were a perfect place, former WEC champion Anthony Pettis would have rode the massive wave of hoopla he established with his highlight reel kick by immediately unifying the lightweight crown against the winner of the New Year’s Day scrap between UFC champ Frankie Edgar and Gray Maynard. Unfortunately for “Showtime,” UFC president Dana White opted to go with ‘Edgar vs. Maynard III’ after the 155-pounders fought to a highly controversial draw at UFC 125. Pettis felt his skyrocketing career couldn’t wait and decided to make his big league debut against a gritty Clay Guida. Most enthusiasts felt it was a bad matchup for Pettis, as “The Carpenter” has a knack for grinding out wins with his relentless nature. Although that’s exactly what happened Saturday night at “The Ultimate Fighter 13 Finale,” Pettis still feels he made the correct call by not sitting the sidelines. 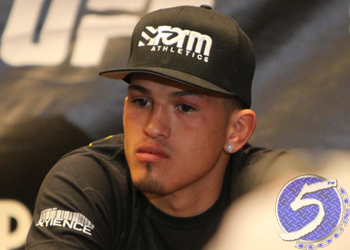 “No, not at all,” Pettis flatly stated when asked if he would have done things differently. “I feel I have some holes in my game. Clay Guida and Greg Jackson did a good job of coming up with a great game plan and I gotta go back to the drawing board and get better at everything. It was a hard lesson learned for Pettis.